The State of environmental Services provides us these guidelines, our experience will mimic most of their explanations as well, AMC Contractors is your Riverside County Authority on septic tanks. Septic systems are considered to be on-site systems designed to safely dispose of biological sanitary waste. “Gray water”, such as laundry waste, is part of the waste system, but it may not result in what is referred to as “biological” waste. How do septic systems work? 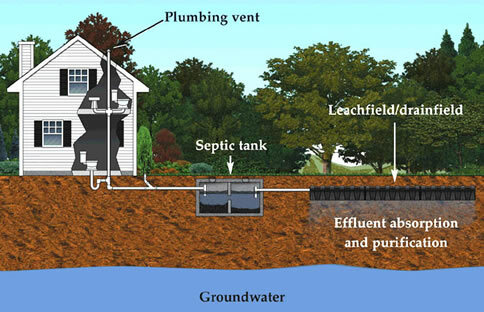 Basically a septic system provides a “holding Tank” where natural bacterial action decomposes human waste products into environmentally acceptable components – the major end-components being water, mixed with some other components that are not readily consumed by the bacterial action, gases, and undigested solids. The end products, except the undigested solids, are then discharged to the on-site environment. What are the components of a private septic system? The things that are most obvious are the things seen every day – the sinks, toilets, and pipes in a normal house. What are not visible are the things that are underground; the things that are underground, and the ground itself, greatly impact how a septic system works. The individual parts of the system are the septic tank, a distribution box, and a leach field. Bacterial action takes place in the septic tank where the end products are mainly water, gases, and undigested material, called sludge that sinks to the bottom of the tank and scum that floats to the top of the tank. The septic tank contains baffles that prevent any scum that floats to the surface and sludge that settles to the bottom from passing out of the tank. The gases that are generated vent to the atmosphere via the plumbing vent system. From the septic tank, the segregated and relatively clear liquid flows into a small distribution box where it is then metered out to several perforated pipes. These perforated pipes then deliver the liquid to a large soil surface area, called a leach field, or absorption field, for absorption. The soil also acts as a filter to remove any small amounts of solids that may be carried along with the liquid. The sludge in the bottom of the tank must be periodically pumped out and properly disposed of. Where are septic system components located? The concrete, or sometimes steel, septic tank is buried in the ground, usually a minimum of 10 feet from the house. The top of the tank is usually about one foot below the soil surface so it can be periodically opened for inspection and pumping. If you do not know for sure where the tank is located, locate where the house sewer pipe leaves the house. In a house with a basement, this is where the pipe passes through the wall. Locating the exit point may be more difficult for a house with no basement. If the pipe exit can be found, the tank normally begins about 10 feet from the house outside wall and in line with the house sewer pipe. If the soil is not frozen, the tank can be located by pushing a slender metal rod into the ground until it hits the buried tank. An inexpensive metal rod about 1/8 inch in diameter for can be purchased at most hardware stores. Be careful when probing for the tank and avoid hammering the metal rod into the ground – you could break a sewer pipe. The distribution box is much smaller than the septic tank and is usual found about 20 feet from the house. It too is usually only about one foot below the ground. You can probe the soil carefully to locate the distribution box with a slender metal rod. From the distribution box, several pipes direct liquid to a series of pipes in trenches called laterals. The pipes in the trenches have holes in them to allow the liquid to be evenly distributed within the trench. To keep the pipes from being blocked with soil and to provide a space for water to be stored while it is being absorbed by the soil, the pipes are laid in a bed of crushed stone. Above the stone is a soil filter (usually one or two layers of what is called untreated building paper). Above the soil filter is top soil in which grass is planted. If the liquid effluent cannot soak into the soil surrounding the leach field, sewage may back up into the system and overflow into the house or puddle on the surface of the ground. There are several possible causes for this problem. Poor Soil Conditions; Faulty Design or Installation A leaching system placed in unsuitable soil, a system that is too small for the house it serves, or an improperly constructed system may lead to early failure. Soil Clogging If sludge or scum is allowed to escape into the distribution box and from there into the leach field, the soil will quickly become clogged. If this happens, the liquid will no longer soak, or percolate, into the soil. This condition can be caused by broken baffles in the septic tank that allow sludge or scum to escape. Failure to have the tank pumped can also lead to a situation where the sludge and scum overwhelm the baffles. High Water Table During wet, or abnormally wet, seasons groundwater may rise into the leach field and force sewage upward to the ground surface. This condition may mean the system has to be re-installed at a higher level. It may also be possible to intercept the high groundwater with a series of drains around the system called “curtain drains”. Roots The roots of trees and bushes planted too close to the system can sometimes enter and block the pipes of the system. Removal of the plants and clearing the pipes of the roots is usually required. Physical Damage Trucks or heavy equipment passing over the system can damage pipes and joints to the point of rendering the system inoperable. You should be aware of the location of the system and direct traffic to avoid such damage. How long should a septic system last? What are the signs of a failing system? Sewage backup into the home is one possible sign of a failing system. However, backup can also be simply the result of a blockage somewhere between the house and the septic tank (this is relatively easy to fix). Another possible sign of failure is a smell of sewage outside the house. If this smell is more noticeable after a lot of water has been put into the system – multiple showers or several loads of laundry (if the laundry waste discharges into the septic system), for example – this may be an indication that the leach field is failing. The smell may also be accompanied by a “spongy” feeling in some areas of the leach field, near the distribution box, or near the septic tank. The “spongy” feel may be caused by water and waste being pushed to or near ground level. If ponding water is also seen, this is called “breakthrough” and is an almost positive indication of failure of one or more parts of the system. This smell, however, can also originate at the plumbing vent. In either case, further investigation is warranted. If you see such signs, a dye test may confirm your suspicions. For this test, a special strong dye is put in the system – usually by flushing it down the toilet. A significant amount of water is then washed into the system. If there is “breakthrough”, the dye will become visible on the ground surface. If the dye is seen on the surface, this would be a very strong indication that the system has failed. Your Home Inspector, a licensed professional engineer, or a septic system contractor can usually perform this test for you if it is needed. If I plan on repairing, installing, or replacing a system, what should I expect? There are two major factors involved in adding a new system or repairing or replacing an existing one. The first is the cost; the second is the inconvenience of possibly not being able to use the existing system while a replacement is being installed. For new construction, the second factor is not usually a major consideration. Repair or replacement cost will obviously depend on what has to be repaired and/or replaced. If the repair does not involve the leach field, the cost may be high, but it will probably not be exorbitant. The least expensive repair will be associated with a broken pipe between the distribution box and the house. The cost for this type of repair is in the order of several hundred dollars. If only a septic tank needs to be replaced – and the leach field is still undamaged – the cost will be in the order of about $1500 to $2500. If a new leach field is needed, and there is room for such an installation, you should plan on spending an additional $2000 to $3000 for a typical home. If there is not sufficient room for a new leach field, the existing field, including the clogged soil, must be removed and a completely new system must be installed. Such an effort can easily exceed $10,000. If my family is growing and I add a new bedroom, what should I expect? Septic systems are designed to dispose of household biological waste. The amount of waste to be handled depends on a number of factors. Among these are the number of people living in the house and their lifestyle. After many years of experience, a major guideline in determining the size and capability of a septic system has been correlated to the number of bedrooms in a house. The number of bedrooms typically determines the number of people generating waste and hence the amount of waste that must be handled. If your family is growing and a new bedroom is needed, then the load on the septic system is also increased. If the septic system capability does not keep up with the increased demand, system failure may occur. So, how do you determine the septic system needs for your growing family? The following sections deal mainly with sizing a septic system so that it can adequately perform the desired function. Your design professional can handle the actual testing and number-crunching – but we have provided some standard guidelines developed by New Jersey to aid you in discussing your options with your contractor. You may not need all this information, but it could help in making your decisions. How big should a septic tank be? How big should the leach field be? Determining the required size of a leach field is a bit more complicated. The first thing to consider is the nature of the soil in which the leach field is to be constructed. Because water has to be absorbed in the soil, we need to know how fast it can be absorbed. This is called the percolation rate and is expressed as the time it takes for water in a test hole to decrease in level by one inch (minutes/inch). We must also know the type of soil and whether seasonal changes in the natural level of groundwater will interfere with the satisfactory operation of the system. Seasonal groundwater must be more than four feet from the bottom of the leach field trenches. Judgments regarding the soil conditions and percolation rates are best left to a professional. If the soil percolates very fast (less than one minute per inch) or very slow (greater than 60 minutes per inch) it will not be possible to install a standard leach field in the existing soil. We must now determine the amount of water that has to be absorbed each day. As with the septic tank sizing, there are also “rules of thumb” that can be used to find out how much water must be absorbed each day for each bedroom in the house (expressed as gallons per day per bedroom). For older houses (built before 1979) we must allow 150 gallons per day (gpd) per bedroom. For houses where the toilets are limited to no more than 3.5 gallons per flush and the faucets and showerheads are limited to 3 gallons per minute or less, we must allow 130 gpd per bedroom. For houses with water-saving toilets that use only one gallon per flush we allow 90 gpd per bedroom. The required flow rate is found by multiplying the appropriate flow by the number of bedrooms (in this case, we do not have to count a garbage disposal as a bedroom). Knowing the rate at which water can be absorbed by the soil (the percolation rate) and the flow rate (in gallons per day), we can use the following table to calculate how many square feet of absorption field is needed. Now that we know the number of square feet of absorption field that is needed, we can divide by the width of each trench to see how many feet of trench is required. The normal trench width is two feet. Let’s do a sample calculation to see how this works. Assume you are buying a 3-bedroom house that was built in 1971. The leach field has failed and a new one must be installed. You have had a percolation test performed and the design professional has determined that the soil is suitable, the groundwater conditions are acceptable, and the percolation rate is 32 minutes per inch. How big an absorption field will be needed? Since the house was built before 1979, the flow rate is 3 bedrooms times 150 gallons per day per bedroom, or 450 gallons per day. From the table above, the application rate is 0.5 gallons per day per square foot for a percolation rate of 32 minutes per inch. The required trench area is then 450 gallons per day divided by 0.5 gallons per day per square foot. You will need 900 square feet of absorption area. If the absorption trenches are 2 feet wide, you will need a total of 450 feet of absorption trench. Most health codes limit the length of any one trench (called a lateral) to no more than 60 feet, the minimum number of laterals is 450 feet divided by 60 feet per lateral, or 7.5 laterals. Where property conditions permit, it is best to keep the laterals the same length, so your design professional may specify 8 laterals, each 60 feet long. But what if there is only room on the property for laterals that are 45 feet long. In this case, you would need 10 laterals, or trenches. In addition to the area needed for the leach field, you should also allow room for possible expansion (50% expansion area is required in New Jersey State). The system discussed above is a conventional system installed in the soil that exists on the site. Where the site conditions do not lend themselves to installing this type of system, there are alternatives. For example, if ground water or percolation rates are unsuitable, it may be possible to install what is called a “mound” system. In a mound system, a suitable soil is placed above the unsuitable soil. A conventional system is then installed in the mound. There are some additional requirements for this type of design. If there is not enough room for a conventional leach field, it may be possible to install one or more cesspools, or seepage pits. These units are usually round, require less open ground, and are deeper than a conventional leach field. Again, there are specific requirements for these systems. Conventional, mound, and seepage pit systems all work by what is called anaerobic bacterial action. This means the bacteria work without oxygen. Some systems are designed to be aerobic – meaning the bacteria need oxygen (air); There are also hybrid systems that use a combination of anaerobic and aerobic sections. Your design professional will advise you if one of the non-conventional systems is best for your needs. These days more than ever people are spending money more wisely and working smarter to make their dollars go a little further. So in order to extend the life of a septic system, caution should be advised in monitoring and entering its water usage as a general rule of thumb. It is also important in fixing leaking faucets and toilets, and making sure not to over load a septic tank with solid materials such as garbage or the use of garbage disposals that the system was not designed for, and regularly pumping the tank will assure longevity in most cases. A septic tank should not cause you problems, in fact being educated about a septic tank can save you thousands of dollars. If you are fortunate enough to have one of these necessary and most help technologies it is most like likely that you live in a suburban area that has no access to a municipal sewer. It is sometimes something that can often be a forgotten aspect of many dwellings. Unfortunately if the system does not work right it can be a very costly problem. It has a septic systems function on the principle of bacteria breaking down all materials then it produces a flow of water into a leech field, this is often call the drain field, this is said to be absorbed in the ground. Here are a fluent is either evaporated buzz online or absorbed into the soil where it is naturally filtered before you can reach of the underground water table. This is crucially important in today’s Green world. The water table and water conservation are important for the Healthcare System. Water usage should be kept to a minimum to assure optimum performance. Septic system require a certain amount of meetings to function properly, and we can’t reaffirm this the most. In fact it is probably So Cal Septics number one called service next two certifications required for purchasing a new home. It is important to know that no of a septic tank will last forever and usage and time will eventually cause failure. Proper maintenance we’ll add insurance to getting the most and most use of your system. So Cal Septics services the Riverside county areas. Households that are not served by public sewers usually depend on septic tank systems to treat and dispose of waste water. A well-designed, installed, and maintained septic system can provide years of reliable low-cost service. When these systems fail to operate effectively, property damage, groundwater and surface water pollution, and disease outbreaks can occur. Therefore, it makes good sense to understand and care for your septic tank system. having your septic tank inspected and pumped on a regular basis. Maintenance of a septic tank. Unfortunately, there is no absolute way to predict how long a septic system will last or if it will be able to handle an increased load. A septic inspection, however, can yield useful information on the condition of the system as it exists when the system is inspected. While predicting the future with regard to the septic system is not part of any septic inspection, the inspection often uncovers defects in the system which can save the purchaser unexpected expense. There are many different types of septic systems ranging from what are called conventional in-ground systems to sand mounds and from spray irrigation systems to stream discharge systems. There are also seepage pits, cesspools, and homemade systems. Because various and unique factors are variable and unrelated at times to each situation, periodic inspections should be conducted to determine the condition of the tank and its components and whether or not thetank should be pumped. Inspections are a necessary part of the operation. AMC Contractors have been installing and repairing Septic Systems for 30 years. It’s a very painless procedure. We at AMC Contractors make sure you are not inconvenienced. During the repair or installation you are never without the use of your bathrooms or kitchens. We will find the most cost effective Septic System for your home. AMC will repair or install your Septic System quickly, efficiently, and professionally. Call us Today for a free estimate. It will be the best decision you ever made. We have been in business in the Inland Empire since 1981. We are a family owned business, and are dedicated to teaching you all about your Septic System. Why choose AMC Contractors (Southern Cal Septics)?